Fetch’s mission to re-home and rehabilitate at risk dogs would not be possible without the help of our dedicated foster families. Each Fetch dog is placed with a foster home to be fully evaluated, seen by a local vet, and exposed to life in a home environment prior to being eligible for adoption. Fetch fosters are dog lovers with all levels of experience who are willing to open their homes to foster dogs for 1-3 months at a time (on average) until they are adopted. Fosters play an essential role in Fetch’s mission by acting as advocates for the pups in their care. From addressing health concerns to working on basic obedience to facilitating the adoption process, these individuals and families treat each pup as their own and are involved in every step of the rescue process. Fostering is the perfect way to learn about the responsibilities of dog ownership without the cost or life-long commitment of dog ownership. Fetch matches each foster with a Foster Partner, an experienced volunteer who will provide foster training and guidance throughout the process. Fetch coordinates resources such as donated supplies, dog sitting, dog daycare, transport assistance, vetting at no cost to our volunteers, and training expertise to ensure that each foster feels supported throughout their foster dog’s stay. We believe that our volunteers are our greatest asset! We put on educational seminars, events, happy hours, and other opportunities, so each foster can learn and grow with other like-minded individuals. As fosters, our job is to identify our foster dogs' needs, work with them to fulfill their potential as household pets, and to assist the adoption team in finding their perfect forever families. Fetch fosters understand that not every dog will arrive already a perfect match for our household lives. Just like humans, each foster dog will come with quirks. While fosters are always provided with photos and information about the personalities and health of each dog (to the best of Fetch's knowledge) prior to choosing a foster pup, we are always prepared to deal with the unexpected. As fosters, we take responsibility for working with our pups to overcome any fears, bad habits, or health issues that might arise prior to adoption, even if we didn't anticipate them ahead of time. Whatever comes our way, Fetch fosters commit to treating each foster pup like our own. We know that life happens and are equipped to adjust and accommodate our foster pups the same way we would our own pets. We are trusted by Fetch to take advantage of the many health, behavioral, daycare and other resources available to us and to be unafraid to ask questions in order to set our foster dogs up for success. Fosters understand that just as it's important to help these pups learn and grow, we are expected to meet them where they are, to be flexible and compassionate, and to learn and grow ourselves. "I foster because senior dogs, who may not have had the greatest lives in the first place, deserve a warm bed and love and care in their last few years. It absolutely warms my heart to see them transform from unsure, skinny and scraggly into smiling, beautiful pups. Seniors don't ask for much, and the love they give is some of the most pure love there is." "Fostering makes me a better dog owner. I've learned so much due to Fetch's great network - classes and seminars and the wisdom of other fosters. I can get help deciding between a gentle leader or front-clip harness for a strong walker or advice on what will help calm a shaking little dog during a storm. My foster pup and I aren't in this alone!" “Fostering doesn't have to be a totally selfless thing. It's also excellent therapy. I very recently started fostering, and one of the reasons is that sometimes I honestly like animals better than humans. When the world gets you down and people are otherwise exasperating, you can always rely on your furry (foster) friends to remind you that life is good and puppy snuggles are aplenty." Can I foster if I don't live in the Madison area? If so, do I pick up the dog or does someone from Fetch bring them to my home? Fetch welcomes foster families from any area of the state! Fosters can either pick up the dog from the Madison area, or we can arrange a transport to get them to you. Vetting will still need to be done in the Madison area, and we can help with transport if you are unable to take the dog to the appointment. Can I foster if I live in a condo/apartment and don’t have a fenced-in yard? Absolutely! Every dog has different needs. Fetch works hard to match the right dog with the right foster home, and for many that does not need to include a fenced-in yard. How am I matched with a dog for fostering? All Fetch volunteers that have expressed an interest in fostering are added to a contact list for the organization. As we consider pulling at-risk dogs from shelters, we reach out to our foster contacts to determine whether there will be a suitable foster home for the dog once they arrive in our care. Volunteers are able to accept or decline fostering based on the information provided on a specific dog. What costs am I responsible for as a foster? Approximately how much does fostering cost? Foster homes cover basic care costs include dog food, toys, treats and miscellaneous supplies like food bowls or kennels. While all dogs and foster families are different, most foster families report average expenditures of approximately $40 per month. Fetch pays for all pre-approved veterinary expenses. How long should I expect to foster a dog? Is there a maximum length of time they can be with me? Dogs can stay with their foster home for as little as a few days, or as long as a few months, depending upon the dog in your care. When reaching out to potential fosters, Fetch always tries to estimate the length of time we expect a dog to need foster care, based on age, medical needs and more. What if I need to go out of town and am fostering a dog? Fetch has a variety of volunteers who are eager to spend time with our dogs, but aren’t able to foster at this time. With a few days advance notice, we will match you with a dog sitter who can take care of your foster dog while you’re away. What if the dog doesn't get along with my dogs? We recommend a slow transition to introduce your dog to other dogs to avoid any conflicts. Sometimes it takes a little longer, especially with dogs that may have a difficult past. We have great resources and we'll help you through it. If conflicts do arise, Fetch will try to move the dog to another foster home. Please note that this can take weeks to do. What information am I responsible for providing to Fetch? Fetch requests that all foster families provide a minimum of weekly updates on the progress of the dog. Each foster home is assigned a “Foster Partner” who will walk you through the process, explain what information is needed and ensure updates are received. These updates, as well as any photos you share, will be used on the Fetch website and social media channels to provide information to individuals interested in adopting. What role would I play in the adoption process? As the foster family, you know the dog best and play a vital role in helping us place the dog with the home that is the best fit. Fosters are required to fill out the Foster Dog Placement Request form when they feel their dog is ready for adoption, which is after the dog has been vetted (up to date with shots, has current CVI, all health issues addressed). Foster dogs do not get advertised on social media or on Fetch's website until after the Foster Dog Placement Request form is filled out by you. This ensures that adopters are not setting their hearts on a dog that may need medical care or behavioral training in order for the dog to be adoptable. 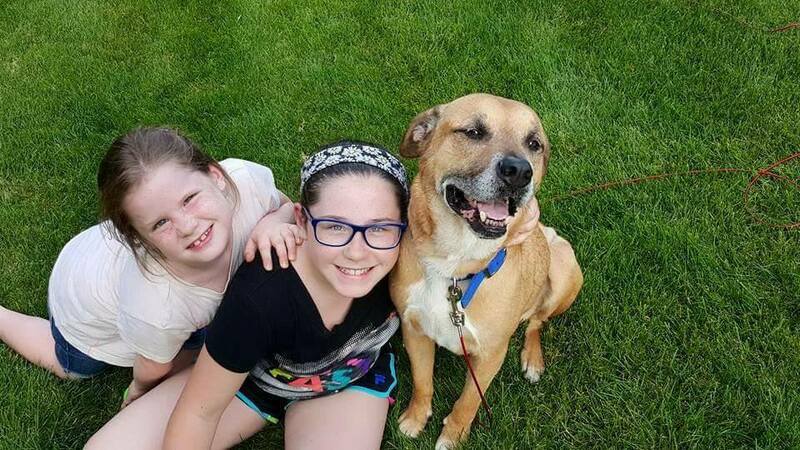 The Foster Dog Placement Request form also signals to the adoption coordinator that you as the foster family do not plan to adopt your foster dog. Foster homes will then review adoption applications sent by the Fetch Application Coordinator to determine whether the adoptive home is a good fit for your foster dog. You will also set up meet and greets with interested individuals and facilitate the adoption if the meet and greet goes well. Yes, fosters have the first option to adopt their foster dog. We ask that you make that decision within the first two weeks and before placing the dog for adoption. Friends or family interested in adopting your foster dog must apply through the standard adoption process. Can I specify the size or age of a dog that I'd be able to foster? Yes! We'd love to know your preferences so that you have a rewarding foster experience. When filling out your volunteer application, we encourage you to note preferences, so that we can be sure to reach out to you regarding dogs in need of foster that fit your preference. Submit a foster application here, and someone will be in touch soon.